The June 2014 Franklin & Marshall College Poll found that Democratic challenger Tom Wolf is successfully maintaining his wide lead over Governor Corbett by a 47% to 25% margin. 27% of participants were unsure. 27% of respondents rated Corbett’s governing as “excellent” or “good,” and claimed the economy (23%), his fiscal responsibility (15%), and his successful addressal of PA’s problems (12%) as their reasons. 49% of Republicans voted his job performance as excellent or good (up 11% since January), while only 8% of Democrats and 16% of independent voters ranked him as such. 70% of respondents said Gov. Corbett was doing a “fair” or “poor” job running PA. They claim education issues (27%), economic issues (13%), stagnation in PA (9%), and his handling of natural gas issues as their reasons for their poor evaluations of the Governor. Gaps in public opinion of the candidates seems to suggest that registered voters are at the moment more against Corbett rather than for Wolf. Only 8% more participants viewed Wolf as strongly or somewhat favorable, but 35% more viewed Corbett as strongly or somewhat unfavorable. In addition, while only 9% were unsure of their opinion of Corbett, 32% did not know how they felt about Wolf. Wolf leads across nearly all demographics and all regions. Education (22%) and the economy (13%) were the most cited issues as being most important to respondents in the PA race for Governor. 78% of respondents claimed they were certain they would vote in PA’s election for Governor. When asked who they thought would win the November election regardless of their allegiance, 54% believe Wolf will prevail while just 19% think Corbett will be re-elected. The survey was conducted from June 23-29 and has a margin of error of +/-4.4%. 502 registered voters were interviewed at Franklin & Marshall College’s Center for Opinion Research. Corbett will lose because he’s a Republican. Everyone’s known since the budget plan was halted and cost ridiculous amounts of tax dollars while government employees went without pay for how long. They revealed themselves in true form for what they really stand for. Greedy Old Pricks. Our government should be about what the people need and want. Not what some bankers and corporations think should be. tom corbett will lose because he has not governed fairly. The Gas bonanza promised to pennsylvanians has not produced the bounty expected because Corbett refuses to exact any monies from these robber barons. conservatives I live by see the horrible state of our public schools. and for corbett to reduce funding criminal. Also to refuse medicaid funding placing hundreds of thousands of pennsylvanians without coverage is sinful. How does this man sleep at night. Very peacefully with all the money he recieves from our natural resource. Shame. Only poll he has a chance at is at Blush. Mister David Daino you are wrong again. The way it works in Penn. is republcans are guvenor for 8years then democrattss are guv for 8 years then it goes back n fourth. Any poll (or in your case “pole”) saying that “John Wolf” will win is a phony, because TOM Wolf is running (and will win). There is no “system” in PA for gov serving two terms and Corbett’s defeat will prove their is no such rule/pattern beyond incumbents having a large money advantage. In this case, no amount of money is going to save Corbett unless he can put $40 billion into the general fund. David Daino, the pole that says john wolf will win is a phoney poll because its not comissionad by a poling company. yeah cobettt can still loose the race but hes gonna win in a landslide you watch and see because that’s the way the system works in penna. Democrats DO want to pay for things. Roads, bridges, education, etc. We are adult enough to understand that the government needs to raise revenue to pay for things and that taxes are a fundamental and legitimate means. It’s you and the GOP who childishly think you can cut taxes and magically have enough to cover your obligations. Tom Corbett’s campaign attacks on Tom Wolf’s anti-growth tax the private sector so that government can spend and borrow more would resonate more if Corbett and the Corbett Republicans had not enacted the same policies. Even the bare bones budget increases spending. Republicans are supposed to be fiscally responsible “adults” but Corbett Republicans cannot be trusted with money any more than childlike Democrats who think money grows on trees and that the government is an ATM with no limit that never has to be paid back. 1) Corbett has been a very bad governor. 2) He has absolutely no time to turn around his bad poll numbers. He can’t undo 4 years of failing to properly fund education (the #1 issue). 3) He can’t plug the holes in the budget without raising revenue. And, even if he did, it’s not enough to save him because he can’t fix the previous budgets. Wolf’s advantage here in the poll is nearly 2 to 1. …. then you might make a case for Corbett having a “chance”. But, all those stats, and more, from every poll make it clear that in November, voters aren’t going to the polls to elect Tom Wolf. Voters are going to the polls to REMOVE Tom Corbett. The means of doing that is to elect Tom Wolf. The voters want Corbett out, and they will elect anyone who’s name is not “Corbett”. Corbett didn’t balance the budget. We are running deficits because he didn’t raise enough revenue and revenue fell. 8 Democratic candidates didn’t deluge the airwaves with negative spots against Corbett. 4 of the candidates dropped out without running any adds. (But, I’m starting to see how your math is off by factor of 2, and why you then think Corbett’s doing a good job.) Of the 4 remaining candidates, Wolf ran positive spots, and most of the McCord/Schwartz negative ads were directed at Wolf. And McGinty ran positive ads for herself. Corbett didn’t cut down the unemployment to 5.6% by create jobs. The numbers below show that PA added 60K to 80K jobs since last year. This means that over 40K people dropped out of the workforce, and aren’t counted as “unemployed”. This artificially lowered the unemployment rate, without creating additional jobs. If you put those 40K people back in the unemployment number, the PA rate corrects to 6.3%, again matching the national average. (4 years ago PA was BELOW the national average). WOLF CAMPAIGN, PADEMS, and “FRESH START”, please feel free to source from official and double check my numbers/argument independently to explain how the 5.6% number is bogus. Theres still a lot time for govern Corbet to make a come back and win a nother term . he’s been pretty good governor thus far and he will come back to win in alandslide. Veteran and Patriot — There have been 4 polls since the primary election. Wolf beat Corbett in those polls by 20%, 25%, 20% and 22%. If you think “those polls will change”, there must be dozens of times a candidate has made up such a huge deficit. Just give us 1 example of a candidate losing in 4 different independent nonpartisan public polls by 20% or more with 5 months or less before election day who came back to win a general election. Give us a specific example and we can see if it compares to a race for Governor in the 6th largest state, where the incumbent Governor has approval ratings and receives less than 30%. Give us 1 of those many examples. You are entitled to your opinion, but your answer will show the worth of that opinion. Whoa there folks! I think you’re getting way ahead of yourselves. Kay, just how has Governor Corbett dragged PA down? By cutting the unemployment rate from 8.2% when he took office to 5.6% now? By helping create over 175,000 Private Sector jobs? By balancing the budget for the last 4 years without raising sales or income taxes? In regard to Wolf’s Business acumen, do you mean the same acumen that caused him and his cousin to load up his company with loans to but them out which cost many of his former employees their jobs? Or will he just use that famed business acumen and incorporate the Commonwealth of PA in Delaware like he did his company to avoid paying the very taxes he advocated raising as Rendell’s tax collector and now as a candidate? As for Governor Corbett being way down in the polls it’s not that surprising considering that the 8 Democrat Challengers all ran against him deluging the airwaves with negative spots. 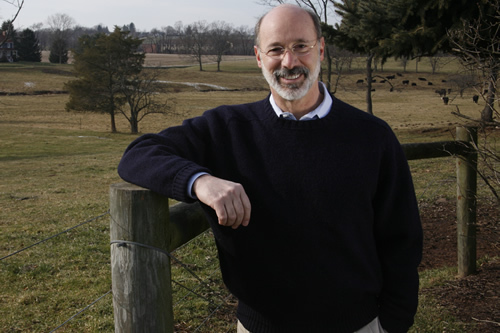 When folks find out who Tom Wolf really is, those polls will change. Corbett has spent the past four years dragging Pennsylvania down. We need fresh leadership, and Tom Wolf has the business acumen and leadership ability to move the state into the current century. A vote for Wolf is a vote for the people of Pennsylvania. The best thing about this poll is that Wolf’s margin is bigger than the entire Philly turnout (Philly is only 16% of the registered voters). So, Wolf can win without a single vote from Philly. This means he can completely ignore Bob Brady, the Philly machine, and any requests for “walking around money”, and save himself a lot of money advertising in the Philly market. An incumbent polling at 25%? Put a fork in him. He’s done. Hardly a surprise. Corbett is deeply unpopular. And he didn’t hold up the budget to request more education funding, so he’s not making progress on #1 issue.